According to the IRS, in 2013 more that 122 million taxpayers filed taxes electronically. Below are some reasons why you may consider filing your tax returns electronically. Any tax software company that you choose to process your return guarantees accuracy of all calculations and checks for any errors that may happen along the way. When you provide your personal information it helps reduce errors by filling out all other areas where that information is necessary. If you are a returning customer, your information is on file and automatically transferred to the current forms. If you have reservations about sending your information electronically know that there have been more than 1.2 billion submissions made this way. 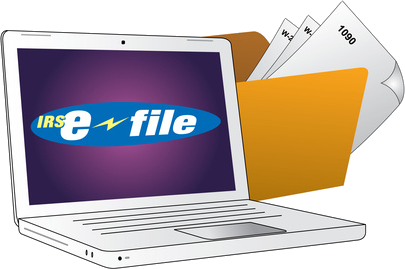 The eFile uses the most sophisticated encryption technology to protect your information. Work on your tax returns whenever you can, save work progress, and file whenever you’re ready. No need to wait in lines to send forms, with electronic filing you can do it any time any day of the week. You will receive a confirmation that your tax return was received and accepted. And if the return is rejected, tax software will point out to the sections that need to be corrected so you can fix them and resubmit. The fastest possible way to get your refund is by efiling and requesting a direct deposit of your funds. The average time the IRS takes under this scenario is 21 days. By eliminating mailing tax returns you save time and ensure the return doesn’t get lost. There is also no wait time for your refund or possibility of it getting lost. Learn more. A flip side of a direct deposit is an electronic payment of a liability you may have. If you efile your taxes and are required to make a payment, you can wire transfer money or stick to the traditional options: check, money order, debit or credit card payment. The IRS and private companies provide plenty of guidance to successfully go through the filing process. There are user communities or help from the companies whose product you choose to file taxes electronically. The user interface has become more palatable with answers to common questions pertaining to each section and even visual guidance of W2s and other required forms. Did you miss the April 15th tax deadline? Here’s what to do. How long does it take to get my tax refund in 2019? Do you have a tax prep checklist ready?